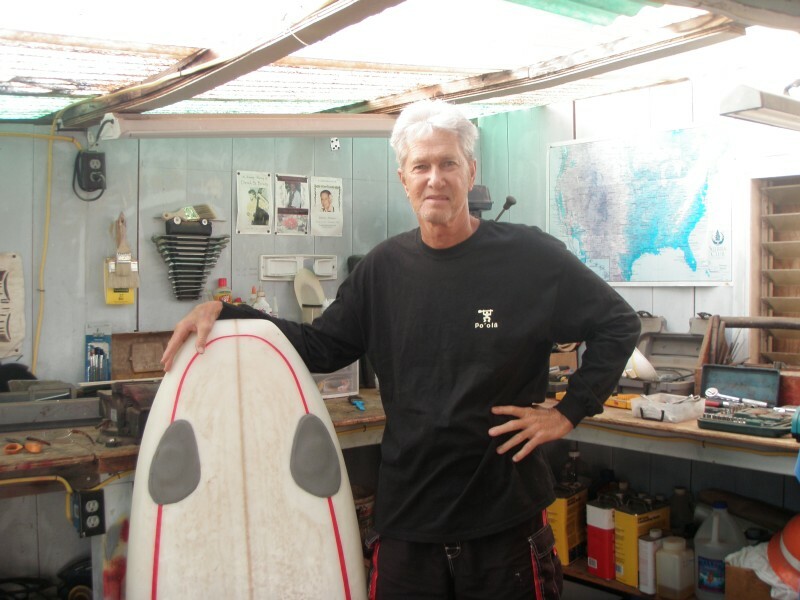 Born Jan 7th, 1946, Manoa, Oahu, passed away Feb 22nd, 2012, due to a suspected heart attack outside Sprecklesville, Maui on a 9-mile down wind paddle in his one-man outrigger canoe. At the time he was paddling and riding ocean swells in 30-knot winds from Maliko to Kahului Harbour with a friend. Many children growing up in Hawaii in the 1960s rode simple ply paipo - Buzzy was no different. He soon progressed onto riding stand-up at Ala Moana and other South shore spots. Later on Maui he windsurfed and more recently has been kitesurfing. He has again caught the paipo bug and speaks of his re-connecting with paipo boarding. The boards are no longer ply but the same stoke is experienced. 1. How did you first get started surfing? When and where was this? Like most kids growing up in Hawaii I was around the ocean from small kid time. After college and during the years of WWII, my Dad hung out with the Waikiki beach boys surfing and fishing all over the south shore of Oahu. He is half Samoan and he got along well with the Hawaiian beach boys and later was involved with Waikiki Surf Club along with George [Downing] and Wally [Froiseth] [see Note 1]. So it was natural for him to take us kids to Waikiki Beach and get us ma’a [used to] to the ocean. Right in front of the Royal Hawaiian Hotel was where I caught my first wave on a plywood paipo at age 7 or 8, and from then to now it’s been a “life sentence” to surfing. As a 10-year-old grom this was probably around 1957-58. I hung out at a place in the middle of Waikiki Beach called Hale AuAu [see editor's note]. This place was a shower/locker room that catered mostly to servicemen but rented surfboard lockers to locals. It was convenient to keep a board right there by the beach and my locker was 147. So this was my base of operations until I joined the Waikiki Surf Club just a few doors down. Photo courtesy of Buzzy Kneubuhl. 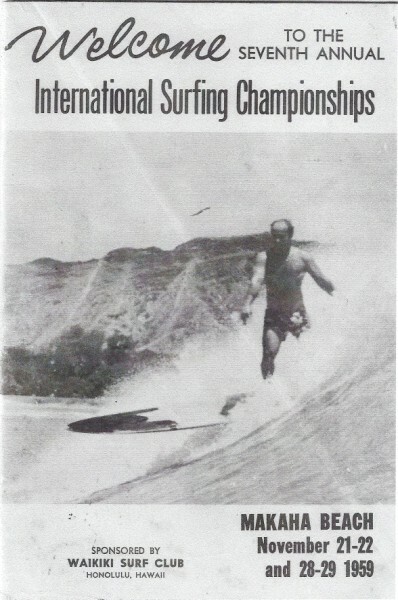 Benny Kneubuhl, surfing Mâili Point on Oahu’s leeward shore in the early 1960s. Photo by Clarence "Mac" Maki. I learned to surf at Queens and Canoes on 8 to 9 foot balsa boards, pre-foam, pre-leash and no crowds. Ten people at Queens was crowded. My summer days were spent honing my chops at these spots. Being a goofy foot I could still ride the Queens rights no problem. I would try to imitate the hot older guys like the Kekai bros, Rabbit and Jama [Jammer], Richard Kauo and Maurice Ikeda. I also spent countless sessions surfing Queens with BK [Barry Kana’iaupuni] and his crew of friends. My Dad, seeing how much I loved surfing decided to start surfing again after a few years layoff and we began building balsa boards. 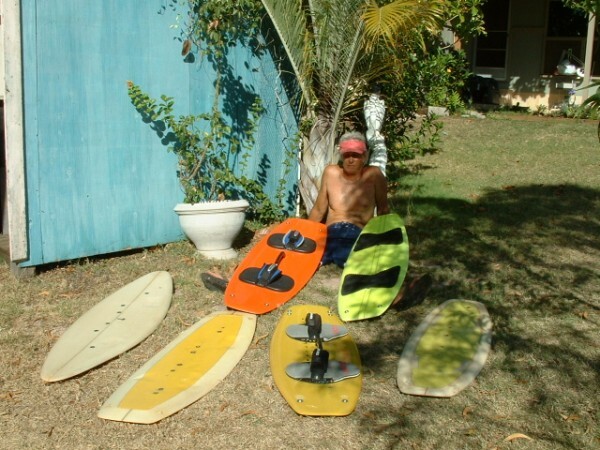 Our garage at our Manoa Valley home was converted into our surfshop and for 10 years my Dad built boards for him, me, and some of our friends. My most cherished memories are of my Dad and I heading to Waikiki for an evening surf, driving down Punahou Hill and being able to see the whole south shore, not one highrise building!! Queens and Canoes were our regular spots and the cast of characters surfing then was the cream of the crop. George and Wally, Joey Cabell, Kimo Hollinger, Kenny Tilton and the best of them all, Paul Strauch Jr., a hall of famer if there ever was one. So Queens and Canoes were my first “home” spots and the streets surrounding Waikiki were where we roamed. It was a great time and place to grow up surfing!!! Buzzy at Canoes circa 1958/58 before his Ala Moana days. 2. 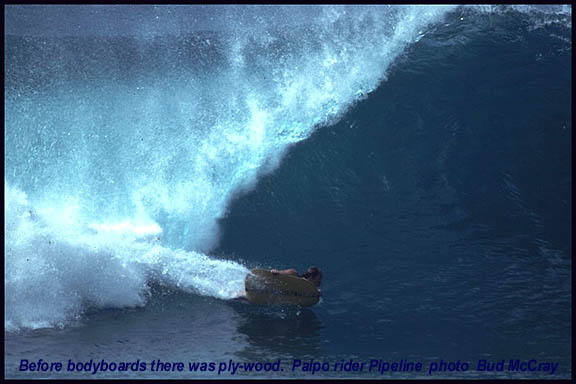 Did you ride paipo boards in these early days? What were these boards like and how were they made? 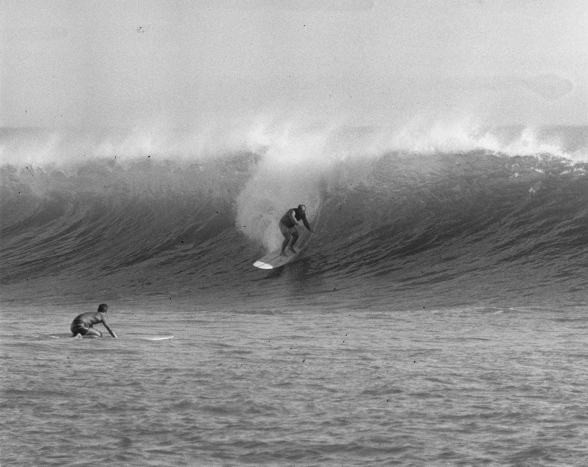 Who do you remember riding paipo and where would you mainly find paipo riders surfing? As mentioned earlier my first waves were ridden on a crude plywood paipo in front of the Royal. The years following this were all spent on surfboards that my Dad built. But there was an epicenter for paipos in Waikiki and this was the “Wall.” The Wall gang were all locals who rode flat plywood paipos. This spot had a short, shallow peeling right that broke in front of this massive cement pier and the crew would have a great time riding prone and sometimes standing up like the famous Val Ching [see Note 2]. The older guys like Wally and company would ride “big” Waikiki at Publics and Cunhas. There were also pockets of paipo riders at Makapu’u, around Makaha and maybe on the North Shore. I didn’t surf the North Shore until I was 13, so I can’t be positive about paipos there but guarantee during the mid- to late-1960’s they were charging Sunset and Laniakea as the old Val Valentine footage indicates [see Note 3]. I heard that you recalled Wally Froiseth riding Makaha. 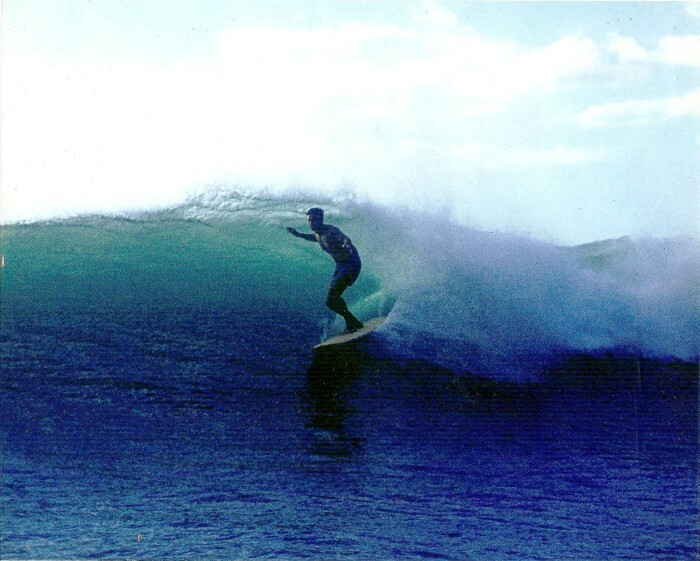 What do you remember about Wally's paipo and surfing at Makaha? I was impressed by the screaming down-the-line speed of the early Wally boards which appeared to be thin, flat balsa boards with a low, semicircular wooden handle just aft of the nose. In the late-1950’s these were state of the art. Truth be told, my friends and I paid little attention to paipos. Our thinking was why ride a paipo like the kids at the Wall when you could ride a surfboard at all the best breaks around Waikiki!!! Wally Froiseth and one of his paipo, circa 1956. 3. 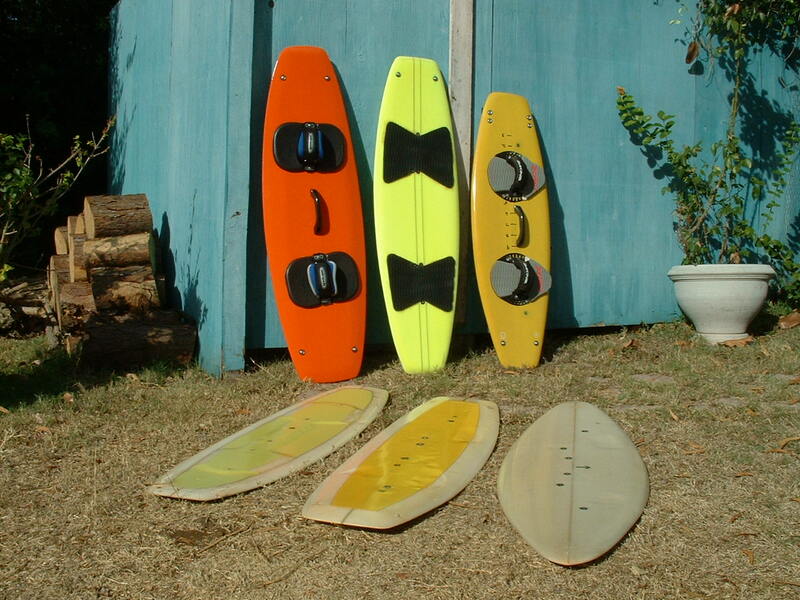 Did you keep riding paipo boards or did your focus change over time? 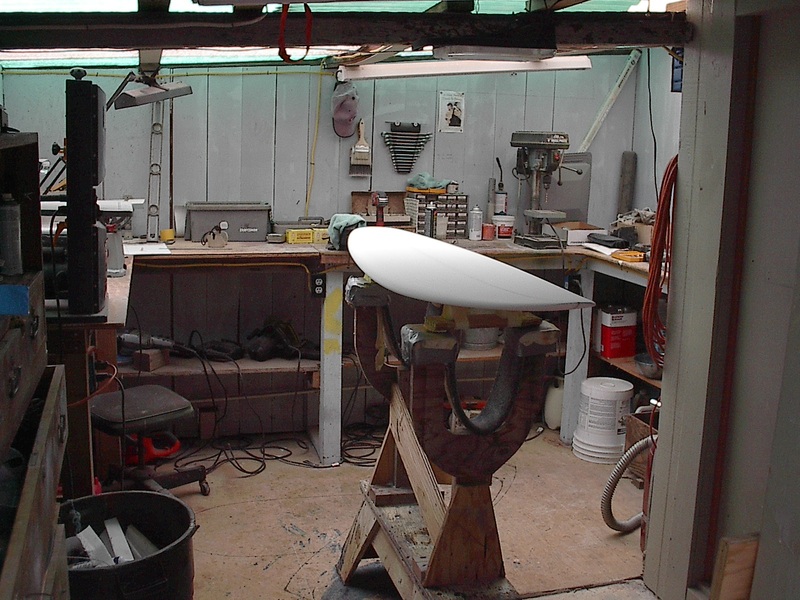 Since we were building boards at home my focus was completely on surfboards. But there was a small contingent of paipo riders who were pushing the limits on these experimental craft all over the island. I’m pretty sure the Makaha Surf Meet had a paipo division to showcase the best riders of the day. As I grew older and better as a surfer we started making the long walk/paddle from Waikiki Beach down to Ala Moana which was a goofyfoot heaven. When we finally got to drive at age 15 we made Ala Moana our home. The harbour parking lot was ground zero for our crew and Alamo was the best left on the south shore. This break is where I saw the best waves and surfing of my young career. There were so many good surfers and there were no magazines or cameras. We still had “Garbage Hole” on the west side of the boat channel which for those unfamiliar with this spot was a pitching, hollow, shallow right barrel with a more longer, forgiving left. 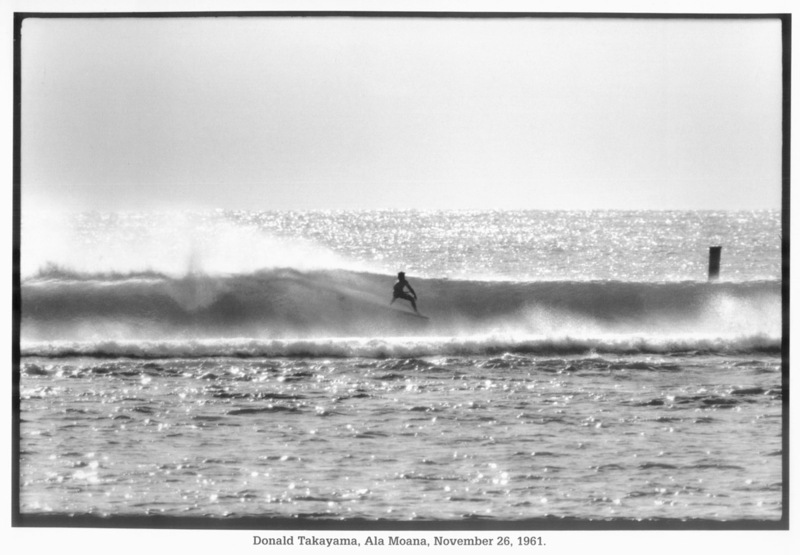 If it were still rideable today it would be a bodysurf/ paipo/ boogie dream wave, it was that good. But alas, the tip of Magic Island sits right where the wave broke. Ah, but I digress. The absolute king of Alamo in the early-1960’s was Donald “Bird Nest” Takayama and right behind him came Sammy Lee, Conrad Canha, Jose Angel and Paul Strauch Jr.. And right behind them came a dozen more rippers. The spot just attracted the best surfers from all over the island. Donald Takayama at Ala Moana, November 1961. Photo taken by LeRoy Grannis, November 26, 1961. Photo used with permission of John Grannis. This photograph also appeared in the book: Grannis, LeRoy, Jim Heimann, and Steve Barilotti. 2007. Leroy Grannis: surf photography of the 1960s and 1970s. Köln: Taschen. And in: Hulet, Scott [As told to]. (2008, Winter). First Person: Donald Takayama. The Surfer’s Journal, 17(6), 29. Conrad Canha at Canoes (below left) and Sammy Lee at Ala Moana (below right). Photo on left by Clarence "Mac" Maki. Photo on right: Unknown. (1963, June/July). Sammy Lee Ala Moana Hawaii [Photograph]. 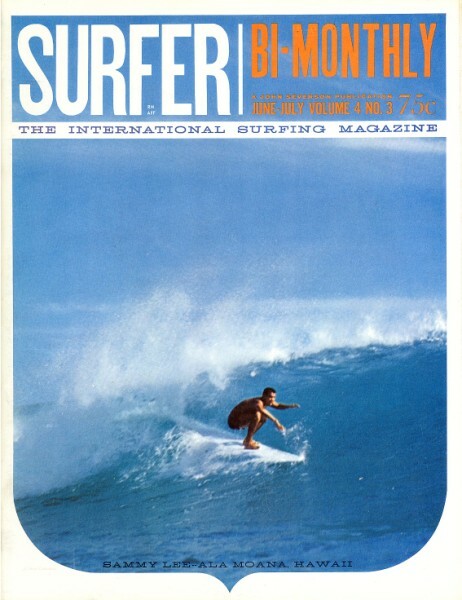 In Surfer Bi-Monthly, 4(3), cover. Conrad Canha at Ala Moana. 4. When did you move to Maui? I got married to a high school [Punahou] sweetheart in 1966, and in 1968, moved to Maui where I have lived ever since, first in Kula and now in Pukalani. I got divorced in 1970, and was a rolling stone until I married my lovely wife Robyn, in 1977. Buzzy with some kiteboards at his shop. 5. You've also ridden windsurfers and kites. What have you enjoyed about these surfcraft? I grew into adulthood on Maui and really diversified my interests. I have hanglided, paraglided, windsurfed and kitesurfed. A few years ago I got into one-man outrigger canoes and riding windchop downwind on Maui’s north shore. Some fun that!! 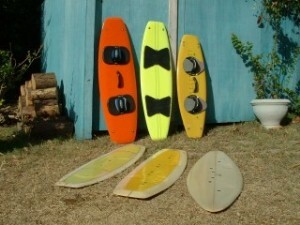 I have built surfboards, sailboards, kiteboards, bodyboards and Greenough Spoons. 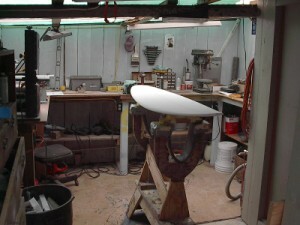 Buzzy's boards and Buzzy's shaping bay. 6. I'd heard you have been getting into paipo recently? What type of boards have you been riding? 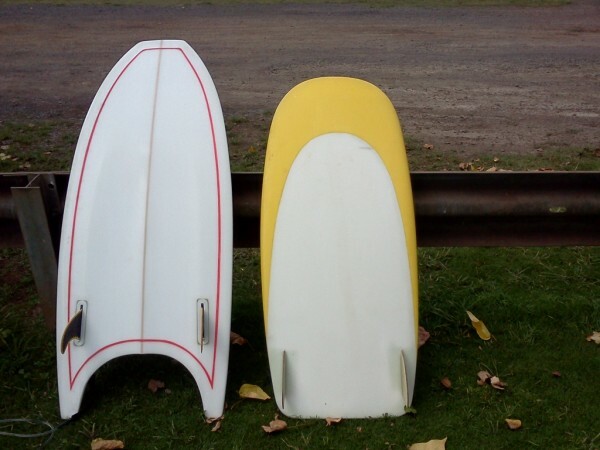 I continue to ride longboards but my latest addiction are paipos or what I like to call "prone surfboards" since they are of foam/fiberglass construction. And the desire to ride prone is what we call ”paipossessed! !” Around 1990, I investigated the world of boogie boards and for 4 years was wired tight to that craft. I bought a new Super Turbo boogie board from the Russ Brown shop on Oahu and loved it. Riding prone again was such a gas!! 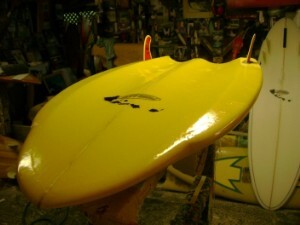 Then I made a foam/fiberglass version of the Super Turbo that worked on bigger and more powerful waves. This was a great change from long board riding. After this phase the other aforementioned sports took over and now I have come full circle back to the love of prone riding. Which leads us back into the world of board design. My recent first attempt at designing a paipo came out with a few obvious flaws which became clear the first few times I used it. What I thought would work only worked part way for my type of surfing. 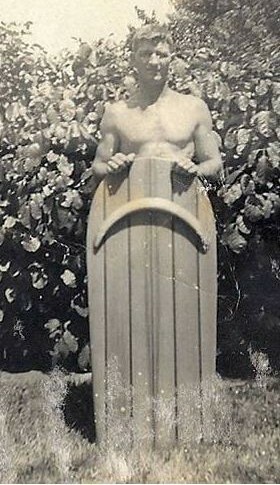 The board is 4 foot long, 22 inches wide, maybe 1.75 inches thick and has a traditional paipo shape of a round nose and large square tail with semi-parallel rails and twin fins (see the board in the photo below right). Where I went wrong was not holding a hard edge from nose to tail and not leaving enough flotation. It would work so much better if those features were in place. 7. What do you know about the WaveArrow boards and how they ride? My new paipo buddy, Robert Moynier [see Note 4], turned me on to the WaveArrow website and Gus Acosta’s new design. I was blown away. I had to try one so I built my own version and this design to me is the future of prone surfboards. What I want in a board is good floatation for paddling power and comfort; a board that carves bottom turns and cutbacks like a surfboard and has the speed of a dragster. Well, this design does all those things. The only flaw so far is that due to it’s thickness it doesn’t duck-dive as well as I would like. I’ve taken a few poundings in the impact zone!! But since my comfort zone is 2 to 6 feet, duck-diving isn’t a big issue so far. I’m already thinking about the things that I might improve on my next board and I have upgraded my board building room to make all phases of construction better. Mahalo ia oe o Gus no keia paipo hou; thanks go to Gus for this new paipo!!! The WaveArrow design is very well planned out with a new age outline and exotic tri-hull bottom and twin fins. Defies old school mentality. See more photographs here. What I see going on with riders on thin wooden boards and the Paipo Nui carbon boards is unwanted body drag from lack of floatation. My riding style is to be up and out of the water with the least amount of body drag possible. The WaveArrow design makes this possible. But to each his own. Find what works for you and build it or buy it and ride some waves and be happy; that is the main thing. We can all be picky and snobby about what we ride but at the end of the day it is the person who is content and happy with his waveriding experience that has a smile on his face. 8. Do you see other paipo riders these days? Everyone is into Boogies these days; "paipos for the masses." Morey must be smiling all the way to the bank. Good for him!!! On Maui, paipo riders are a rare sight. My good buddy Sean Ross who absolutely killed big Pipe in the 1980s, is probably the only Paipo Nui rider on the island and rarely gets wet for lack of friends to join him. This could change when he sees how much fun the modern boards are and the wide range of waves that are rideable on them. Hopefully we can keep the flame burning for a few more years!!! Buzzy wrote of his friend, "we worked together for years as longshoremen and shared many a lunchtime swim workout; it would be an honor to include a foto of him. In his hayday he was an unsung hero mashing heavy pipe on his potato chip with no game plan to follow from riders before him. 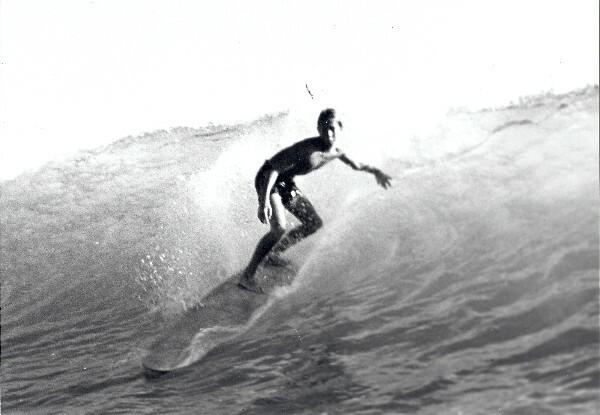 He also shared lifeguard duties with a former king of Pipe, "Black" Butch Van Artsdalen at Ehukai Beach so he was right at home in heavy water." 9. What has been the attraction of riding a paipo and what waves do you like surfing? I have yet to test my paipo skills at the major breaks here on Maui. Crowds and competition turn me off. I surf semi-secret, marginal waves suited more for paipos and I like that fine. As skills and conditioning improve we will most likely seek out more quality waves. My favorite is 3 to 6 foot; that is nuff. After 50 years of surfing I pass on the gnarly situations. 10. Any other comments about paipo, surfing or life generally? Fun, safety, and the overall water experience are what count. I try to look at the bigger picture when I paddle out; the feel of the ocean water and the sun; the power of the ocean moving around me and some of the social things like talking to people and sharing waves. I guess that is what age brings. Slowing things down and enjoying the moment. But…. as soon as I drop in all those old synapses start firing and it is business as usual; bottom turns, cut backs, off-the-lips and down-the-line screamers; then the slow, reflective kick-paddle back out for another round of the juice. Like Lopez said, “surf stoke is a lifetime sentence” and a lot of us are prisoners!! …. Aloha…a hui hou! Note 1: Wally Froiseth is featured in Gault-Williams, Malcolm. (1997, Winter). Surf Drunk. The Wallace Froiseth story, The Surfers Journal, 6(4), 94-109. For a photo see the paipo interview with Jack McCoy. Note 2: Val Ching is featured in Pendarvis, Cher (2010, Winter). Uncle Val. The living link to surfing's high-performance roots. The Surfers Journal, 19(6), 38-47. For some photos see the paipo interview with Jack McCoy. Note 3: Val Valentine's film's included: Northside Story (1963), The Call of the Surf (1964), Surfing Aussie (1965) and Outside (1966). Source: www.surfclassics.com. Note 4: See the paipo interview with Robert Moynier. “Hale” in Hawaiian means “house,” and “ ‘au’au” mean “bath.” The two words combined mean “bathhouse,” a term from Waikiki of yesteryear to mean a place where swimmers and surfers could shower and change. The name and spelling Hale AuAu were coined by Earl Akana in the 1950s for his beach concession with showers and lockers in the heart of Waikiki Beach. It was where the Duke Statue is now. The diacritical marks that we use in Hawaiian words today weren’t in use 60 years ago, so if you’re going to use the name as it was spelled historically, it would be Hale AuAu, and not Hale ‘Au’Au. Buzzy's obituary as it appeared in the Honolulu Star Advertiser (click here). Honolulu Star-Advertiser. (2012). "Buzzy" Benjamin Franklin Kneubuhl III. Honolulu Star-Advertiser Obituaries. Retrieved March 10, 2012, from obits.staradvertiser.com/2012/03/06/buzzy-benjamin-franklin-kneubuhl-iii/.